CELIACZERLINSKI unites zeitgeist with the finest couture craft. Geometrical basic forms arise with elaborate cut technologies to complex, innovatively architectural rooms. Distinctive, elegant, and constantly in flux, the accessories are designed to convey a sense of distinct individualism. Versatility is crucial. From classical elegance to extroverted modernism, every piece is an integral part of a broader concept, each a part of a harmonious whole. From cutting to quilting to the assembly of the metal trims - every step is carried out by hand. The manufacturers' expert knowledge and long crafting tradition, the time consuming production, as well as the carefully selected materials of highest quality all stand for discreet luxury. The finest materials from Italy are combined with precision craftsmanship, hand made in Germany. The handbags and accessories fascinate with their lucid elegance, the ingenious cut techniques used to make them, and their atmospheric range of colours. Only calfskin with fine, natural grain and matt shine from one of the best tanneries in Italy is used. Beside their extraordinary plasticity, the exclusivity of the handbags and accessories' evident by the manually executed quilt work. The accessories of solid metal are individually handcrafted, hand-brushed, and the surfaces are meticulously finished. Moreover, every handbag is lined with suede. All bags are custom-made to order. As a symbol of the uniqueness and quality of these products, a high-quality metal tag engraved with your name or initials can be affixed inside the bag. The collections are consecutively arranged and maintain their distinct validity. 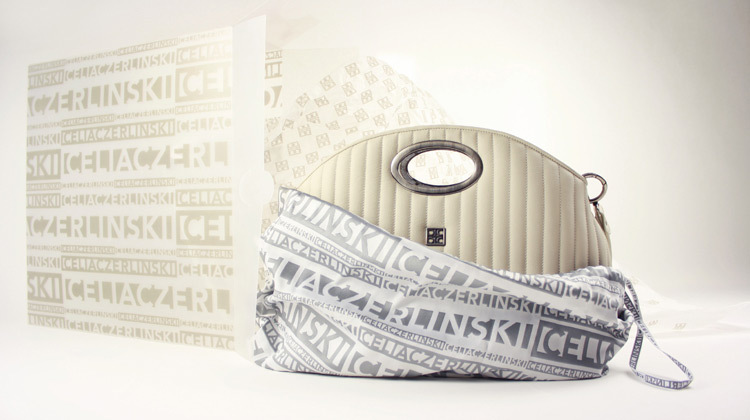 Thus CELIACZERLINSKI frees itself of parameters like seasons or trends and creates timeless designs.